Jeph Loeb and Tim Sale, the Eisner award winning team (DAREDEVIL: YELLOW, SPIDER-MAN: BLUE, HULK: GRAY, Batman: The Long Halloween, Superman For All Seasons, Televisions HEROES) return to Marvel and their prestigious color book series. 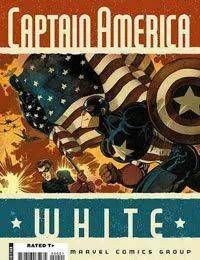 CAPTAIN AMERICA: WHITE is their newest creation, peeling back an untold tale of Captain America and Bucky during World War II. Their unique combination of in-depth characters and high stakes action shines here with Caps deadliest mission of all. Marvel is proud to bring you Captain America: #0 this summer as a taste of what's to come. Featuring an all new full story about the Origin of Bucky Barnes and how he came into Cap's life, this special edition features a plethora of extras. They are happy to be back at Marvel and were thrilled to have them!